If you haven’t realized it yet, 2018 is the year of China. From e-commerce to semiconductors to global trade to politics, China has dominated media headlines. For investors, China has been a double-edged sword. On one hand, e-commerce giants like Alibaba Group Holding Ltd. (NYSE: BABA) have been quite profitable. On the other hand, trade war fears with the U.S. have created considerable market volatility. This past week, investors were smacked with another reality of investing in Chinese-dominated markets. When it comes to market manipulation and regulation, China giveth and China taketh away. Solar investors know exactly what I’m talking about. On Monday, China’s National Development and Reform Commission, Ministry of Finance and National Energy Administration put out a joint statement. The trio essentially put a halt to funding for new solar projects and cut tariffs on electricity generated from clean energy by 0.05 yuan per kilowatt hour. In a sense, China’s accommodative policies toward solar and other forms of clean energy had created a market bubble on the mainland. The new regulations are effective immediately, and are designed to keep the country’s clean-energy bubble from overinflating. The statement had a nasty ripple effect throughout the solar sector. Stocks closely tied to Chinese solar production plunged on the news, and analysts slashed their forecasts for Chinese solar power installations. But the time to sell solar stocks has passed. Now is the time to go hunting for value and add an American solar company to your portfolio at a considerable discount. Buried amid the panic selling surrounding China’s new mandate on the solar sector was a key bit of legislation out of the Golden State. California’s Energy Commission approved standards that require most new homes built after 2020 to include solar panels on their roofs. The commission expects the new standards to cost the state economy $2.17 billion, while generating an energy bill savings of $3.87 billion, for a net savings of $1.7 billion. California’s budget aside, the state just handed the solar industry guaranteed market growth of about 222 megawatts (MW) per year, according to GTM Research. What’s more, GTM projects that this figure could grow to about 650 MW between 2020 and 2023, putting California’s solar market valuation at about $2 billion. The question is, how do investors tap into the new California “gold rush”? With China cutting back and import tariffs stymying growth stateside for Chinese solar giants, the answer lies in a market-leading American solar firm. I’ve been a fan of SunPower for some time. The company has solid growth prospects, with analysts projecting revenue to rise 15.5% next year. This figure was revised higher from 11.9% back in March, and should continue to rise alongside oil prices through the next couple of years. But the biggest reason to invest in SPWR stock now lies with the Golden State. In 2017, SunPower was the No. 2 solar panel installer in California. As such, the company is already well-positioned to take a large chunk of that potential $2 billion solar panel market. What’s more, according to SunPower’s first-quarter earnings report, margins are improving. Gross margins on solar panels rose from 15.3% to 18.6% in the first quarter, despite U.S. tariffs on Chinese imports. Those margins should continue to improve as next-generation technology comes online. Specifically, SunPower’s new product line sports an energy efficiency rating of about 23% (in line with current X-Series panels), but at 40% lower manufacturing costs. The result could push gross margins north of 20%. As a result, the recent plunge in the solar sector has SPWR stock trading at bargain prices right now. After falling off sharply from their April highs, SPWR shares are trading just above the buy levels I recommended when I revisited the stock back on March 2. 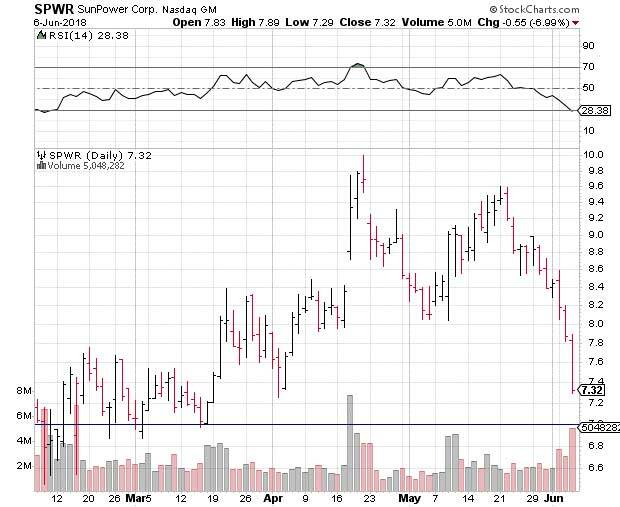 Price support should hold near $7, especially with SPWR stock trading in oversold territory. If you are already holding SPWR stock, now is the time to add to your position. For those new to the shares, now is an excellent time to buy in before the market finally digests the California standards and bids the shares higher. Editor’s Note: On June 12, at 1 p.m. EDT, legendary hedge fund investor Paul Mampilly will go live for an invitation-only broadcast. During this online event, Paul will unveil his most powerful investing methodology to date — a tool he has used to collect the largest, fastest profits of his career. Gains of 200% in seven days … 385% in 31 days … even 1,264% in just 10 days. In fact, just recently, Paul’s method racked up total gains of 3,485% in less than 90 days. You can understand why Paul has kept this a secret for so long … but on June 12, he’ll explain exactly how you can harness this powerful method to start booking rapid-fire profits. To attend this online event, you must secure your VIP seat as soon as possible. Just click this link here for complete details.